If a specific location for your condo life style is important, then give this beautifully updated end unit your full consideration! 2-unit bldg. 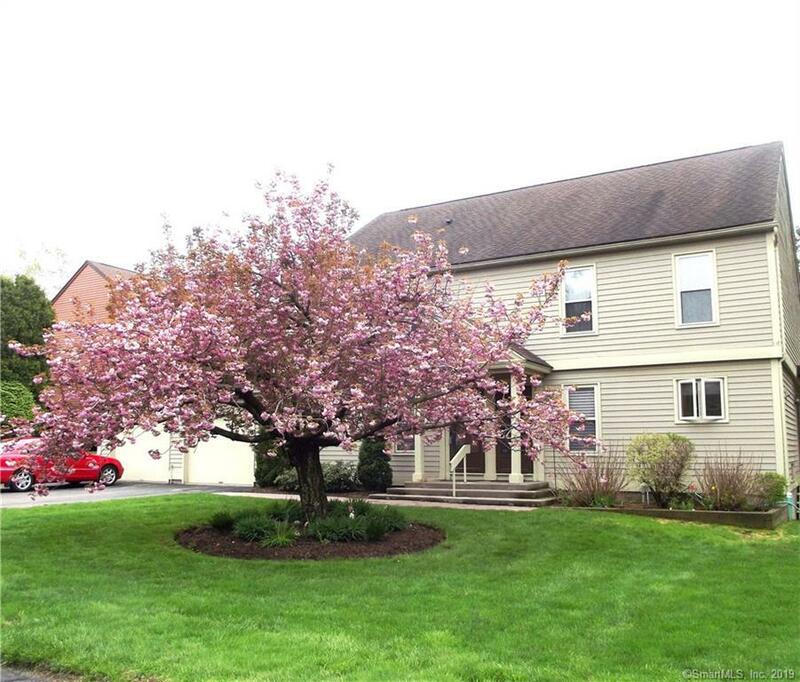 w/pvt.setting overlooking pond, wild-life & views of seasonal apple blossoms! Townhouse living w/2-lower level rms. for more enjoyable living space, an add'l. 240 sq.ft. This space includes a bright FR & a 2nd rm...office/exercise/play rm or study w/great built-ins!! A convenient bi-fold door encloses the lndry in the lower level. 2-car tandem gar. w/add'l courtyard parking. Kitchen, lovely, bright, remodeled, w/maple cabinets, granite counters, breakfast bar, glass door accents, self-close drawers, pull-out features, recessed lights, tile floor, tile backsplash! Open floor plan. Spacious combination LR & DR, oak HW floors. French door to deck. 1st floor stylish full bath w/shower. Turned carpeted, wood staircase to 2 spacious BR's! Attractive full bath w/tub/shower, tile flr. This bath is a "Jack n Jill" style that accommodates the 2 BR's from separate entries & offers 2-additional dbl. closets for more storage. Both BR's feature HW floors & ceiling fans. Central air! Oil fired 32 gal. water heater. Aprilaire humidifier. Wallingford Electric Co. is well known for it's utility costs! Leave the maintenance behind, turn the key & enjoy life. Access to Hallmark Hill, its sister complex to enjoy the pool, clubhouse. A great value in a great complex! Enjoy living in Wallingford with it's many great venues! Great commuting accesses!, Features include crown molding, custom Hunter-Douglas window treatments, recessed lighting, excellent closet storage, 2 Basement systems sump pumps installed by previous owner as a preventative. Current owner had them serviced 11/2018 as part of regular owner maintenance. Hatch exit to rear yard. Thermal-pane windows with screens. Storm door on front entry and on French doors to the deck. Awning in place is operational but will convey "as is". Mint condition! Full brick wall with raised hearth, wood burning FP with custom mantle. Colonial Hill complex has use of pool and club house at Hallmark Hill. Tennis courts are deemed to be not usable. Assessment per month is $81.56. Directions: From Cheshire Or Wallingford To Cook Hill Rd. To Hallmark Hill Condo Complex Entrance (Note H H On Stone Entry Pillars), Take Right To Colonial Hill Complex To Unit # 89. Park In Front Of Only The Left Garage That Goes With The Unit Or In The Courtyard. Laundry Room Location: Bi-Fold Door Laundry Enclosure. Sewer Assess Description: Water Usage And Sewer Usage Is Combined In One Monthly Bill.